The new ETI / Eichmann speaker spades use OFHC pure copper as the base material. 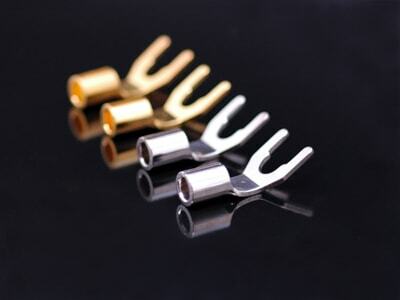 These low-mass connectors come in three variants; bare OFHC copper, silver plated copper, and gold plated copper. These connectors are most ideal when crimped and soldered. Sold as a set of 4. Fits both 1/4" and 5/16" binding posts. WBT-0661 1/4" Copper Spade WHITE - $49.99 ea. WBT-0661 1/4" Copper Spade RED - $49.99 ea. WBT-0681 5/16" Copper Spade WHITE - $49.99 ea. 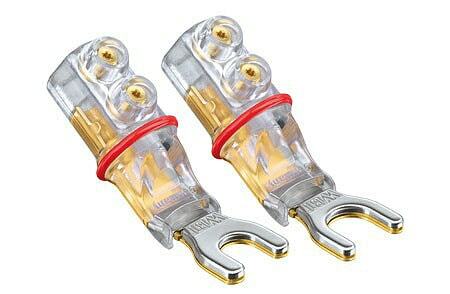 WBT-0681 5/16" Copper Spade RED - $49.99 ea. 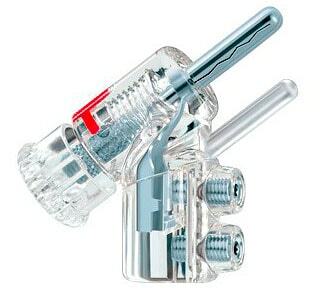 WBT-0661 1/4" SILVER Spade RED - $99.99 ea. 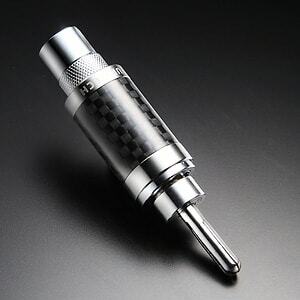 WBT-0661 1/4" SILVER Spade WHITE - $99.99 ea. WBT-0681 5/16" SILVER Spade RED - $99.99 ea. 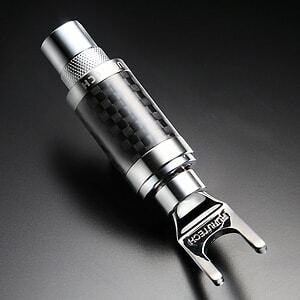 WBT-0681 5/16" SILVER Spade WHITE - $99.99 ea. WBT-0443 (12ga) copper crimp sleeve - $2.99 ea. WBT-0444 (10ga) copper crimp sleeve - $2.99 ea. WBT-0445 (8ga) copper crimp sleeve - $3.99 ea. WBT-0446 (6ga) copper crimp sleeve - $4.99 ea. WBT-0452 (12ga) SILVER crimp sleeve - $13.99 ea. WBT-0453 (10ga) SILVER crimp sleeve - $14.99 ea. WBT-0403 Crimp Tool - $140.00 ea. WBT Torx Key - $6.00 ea. The new WBT-0661 (1/4") and WBT-0681 (5/16") Nextgen Spades have arrived! These new NextGen Topline spades are made from pure copper, and have reduced metal mass even further. The key to the superb quality of the WBT-0661 and WBT-0681 spades is a patented Sandwich design of its contact fork: Elastomer oscillation dampers eliminate airborne noise and mechanical vibrations as well as magnetostrictions, ensuring almost total suppression of contact microphonics, and providing improved fracture resistance of the connection. The WBT-0661 and WBT-0681 sandwiches the contact forks with an elastomer insert in a steel cap resulting in uniform contact pressure, while minimizing transition resistance. 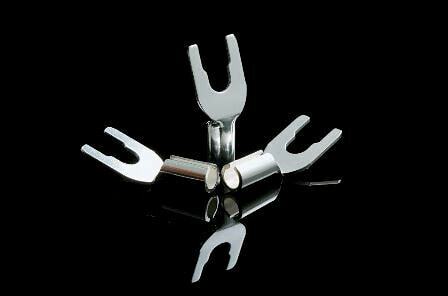 Three punched contact points on the bottom of the fork ensure precise contact, further improving the quality of signal transmission. The surface of the copper conductor is protected against oxidation by direct nickel-free 24 carat gold plating. Easy fit for wire sizes up to 10mm2 (7AWG). 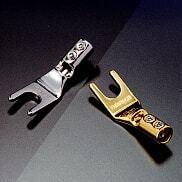 Available in two sizes to fit almost any binding post: WBT-0661 = 1/4", WBT-0681 = 5/16". Color code: red or white. Sold and priced by EACH piece. Yeah, they're expensive, but they are VERY GOOD. For best results use the WBT crimper and crimp sleeves (see below). 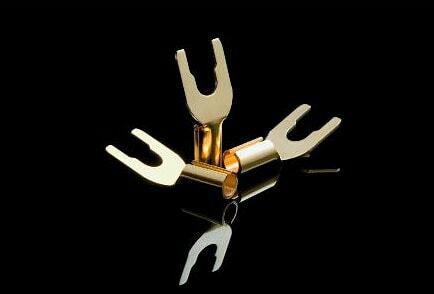 Crimper purchase is refundable when purchased with set of 4 or more connectors. * Late fee will be assessed at $3 per day 3 weeks after ORDER DATE. 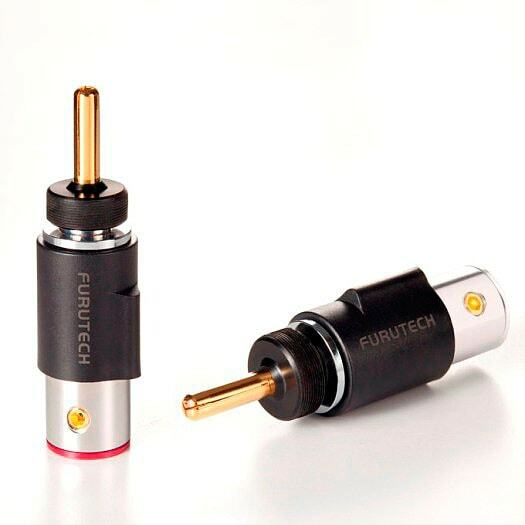 The Furutech FP-201G and FP-201R spade connectors are Furutech's answer to those who want a top-notch audiophile-quality spade connector. Manufactured from PCOCC (Pure Copper by Ohno Continuous Casting), and uses a 4-step plating process of copper-silver-copper-gold or copper-silver-copper-rhodium. If there's a better spade connector out there for this price, I haven't heard it... Pricing is for a set of 4 connectors. Spade size is 5/16" and they accept up to 8 AWG wire. No soldering necessary- there are two set screws that clamp onto the wire, making these re-usable for DIY'er who wants to experiment with various cabling. Furutech's new CF-201R spade connectors build upon the huge success of Furutech's FP-201 series, and requires no soldering. A single set screw allows you to terminate your wire directly to the connector (up to about 10 AWG). The Furutech CF-201 uses a pure (Alpha) copper conductor plated with Rhodium, a non-magnetic stainless steel body, and non-magnetic stainless steel housing that also utlizes carbon fiber. A specially designed copper alloy set screw ensures maximum stability and low contact resistance. Max O.D. cable (with jacket) accomodation is 5.5 mm. Dimensions of the CF-201R is 15.2mm dia X 70.0 mm length. Spades will fit 5/16" binding posts, as well as many 1/4" posts. Sold as a set of 4. If you want to purchase just two pieces, simply enter a quantity of ".5". 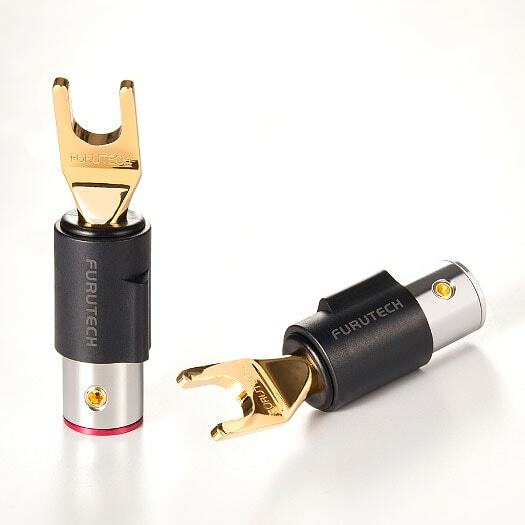 Furutech has also introduced a new line of low-mass spade connectors for speaker cables: the FT-211 series. The FT-211 speaker spade connectors offer a low-mass, pure copper conductor, as well as your choice of either gold or rhodium plating. 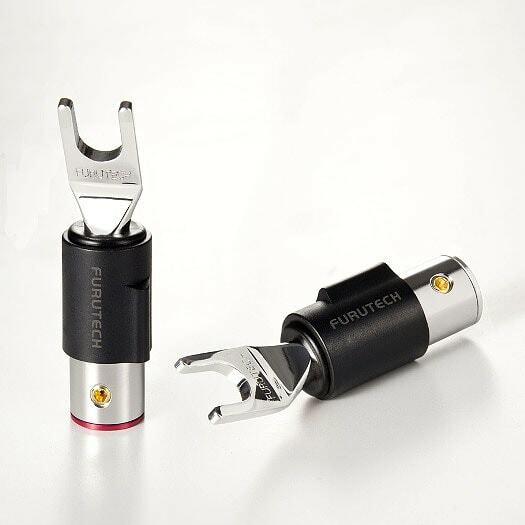 The body uses Furutech's piezo ceramic material to help address resonance issues. A non-magnetic set screw allows easy termination, without soldering. Max O.D. cable (with jacket) accomodation is 7.8 mm. Maximum conductor diameter is 4.5 mm. Overall length is 57.5 mm. Spread is optimized for 5/16" binding posts. The Oyaide SPYT and GYT spade connectors are made from pure copper blanks, polished twice, and then plated with gold (GYT) or a dual layer of palladium over silver. This low-mass design is ideal if you want a traditional crimp/solder style speaker spade. The dual cutouts allow for use on either 1/4" or 5/16" binding posts. Pricing is for a set of 4 connectors, and small sections of heatshrink tube are included. WBT-0610 Cu NextGen Banana - $44.99 (ea.) WBT-0610 Ag NextGen Banana - $99.99 (ea.) WBT-0443 (12ga) copper crimp sleeve - $2.99 ea. WBT-0444 (10ga) copper crimp sleeve - $2.99 ea. WBT-0445 (8ga) copper crimp sleeve - $3.99 ea. WBT-0446 (6ga) copper crimp sleeve - $4.99 ea. WBT-0452 (12ga) SILVER crimp sleeve - $13.99 ea. WBT-0453 (10ga) SILVER crimp sleeve - $14.99 ea. WBT-0403 Crimp Tool - $140.00 ea. WBT Torx Key - $6.00 ea. 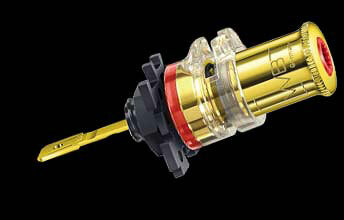 The WBT-0645 angled banana plug has a new thread pitch for faster, more secure fastening. Innovative banana plug approved worldwide as a loudspeaker cable connector due to the safety pin design (International Patent Pending). Fully insulated, high clamping power via expanding inner spike. Easy one hand operation. Extremely compact, sloping angle is easy on cable and equipment. The WBT-0645 is stackable for bi-wiring. Two Torx screws (T-6) for extra-tight pressure connection and additional cable strain relief. Connector body and signal contact metallurgy is 55% oxygen free copper alloy. Plating scheme uses 3 layers: Cu 1.5 microns; Ni 8.0 microns; Au 0.2 microns Color code: red or white. Easy fit for wire size up to 10mm2 (8awg). The brand new NextGen WBT-0610 Cu and Ag bananas are the first bananas to market that use PURE metals (copper or silver), without any conductivity-reducing alloys! The new WBT-0610 NextGen banana series reduces the mass of the signal conductor while providing a robust "locking" termination using an expandable pin. This means consistent, secure contact pressure into any binding post that accepts bananas! The WBT-0610 Ag uses Platinum plating over the solid fine silver base metal, while the WBT-0610 Cu uses 24K direct gold plating over solid pure copper. The angled feuture of the WBT-0610 NextGen bananas adds convenience and uses less space. Max cable size is 10 sq. mm or 7 AWG. For best results with WBT connectors use the WBT crimper and crimp sleeves (see below). The Furutech FT-212 banana connector is another great low mass banana connector for your speaker cables. Unlike many other designs that use brass or bronze, the Furutech FT-212 features their Alpha pure-copper conductor, which allows highly linear signal transfer. The pure, solid copper conductor is housed in a non-resonant POM resin body, and encased in a nylon and fiberglass shell that uses Furutech’s outstanding Piezo Ceramic damping material. The banana pin locks feature a new patent-pending mechanism that offers a secure, reliable grip. Easily terminated with a set screw. Accepts wire diamter up to 6 AWG (4.2mm). Maximum total cable diamter is 7.8mm. 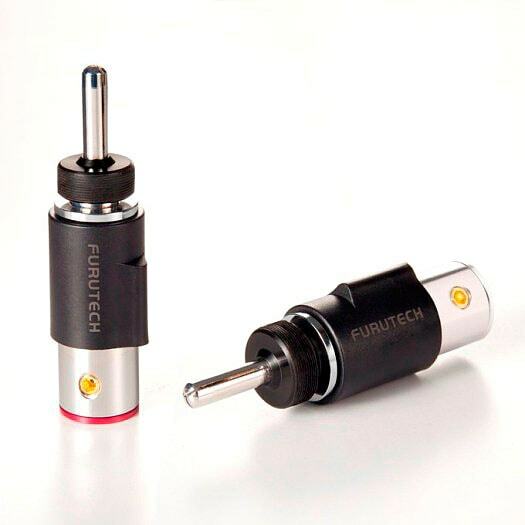 Furutech's new CF-202 R Banana connectors are Furutech's all-out assualt on the rest of the banana connector marketplace. While I have not been overly impressed with many of the banana offerings throughout the years, the newest generation of pure copper connectors by WBT and Furutech (or pure Silver by ETI) mean you don't need to compromise with inferior sounding brass/bronze alloys any more. 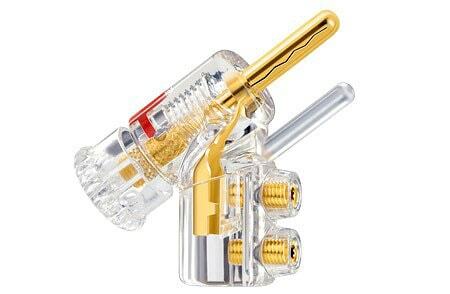 The Furutech CF-202R Banana uses a pure copper (Alpha), rhodium plated center conductor for signal transmission, and utilizes a specially designed set screw for terminating your wire (up to about 10 AWG), which means this connector is reusable! A non-magnetic stainless steel body and housing was chosen for the CF-202 Banana, and carbon fiber is also used to dampen resonances. A strain relief resonance dampening ring is icing on the cake and puts this banana at the top of the heap with the WBT NextGen, IMHO. Will also work very well with smaller diameter wires, and will accomodate an O.D. cable (with jacket) of 5.5mm. Dimensions- 15.2mm dia X 64.2mm length. Sold as a set of 4 pieces, but may be ordered in pairs by simply entering a qty of ".5" when adding to your shopping cart. The ETI Research LINK Banana speaker cable connector is, dollar-for-dollar one of the best sounding banana connectors on the market. Known as a Sawtooth style Banana, this design is unique in the way it will make a near perfect connection between connector and terminal. The punched and rolled Beryllium Copper conductor used in the LINK Banana is housed in a Brass Shell for the strength and stability, allowing multiple plug > unplug cycles without any deterioration in electrical contact integrity. Two termination screws allows for easy, solderless termination, yet strong enough to secure the electrical and mechanical connection strongly. Silver version is 50% off! The SILVER Bayonet is 50% off, for a limited time. 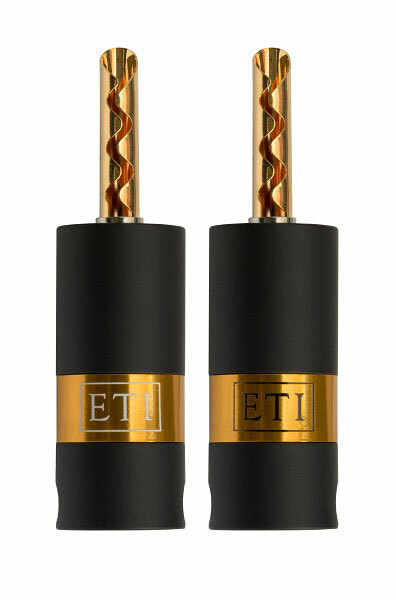 The ETI Research (formerly Eichmann) Bayonet Plug is an innovative approach to speaker cable connection. The result is a low-mass connector that offers better sound quality for speaker cables in all price ranges. The conductive pin is machined from either: a) High-purity Tellurium Copper which provides up to 320% greater conductivity than gold plated brass plugs, or b) High purity .9999 solid silver! 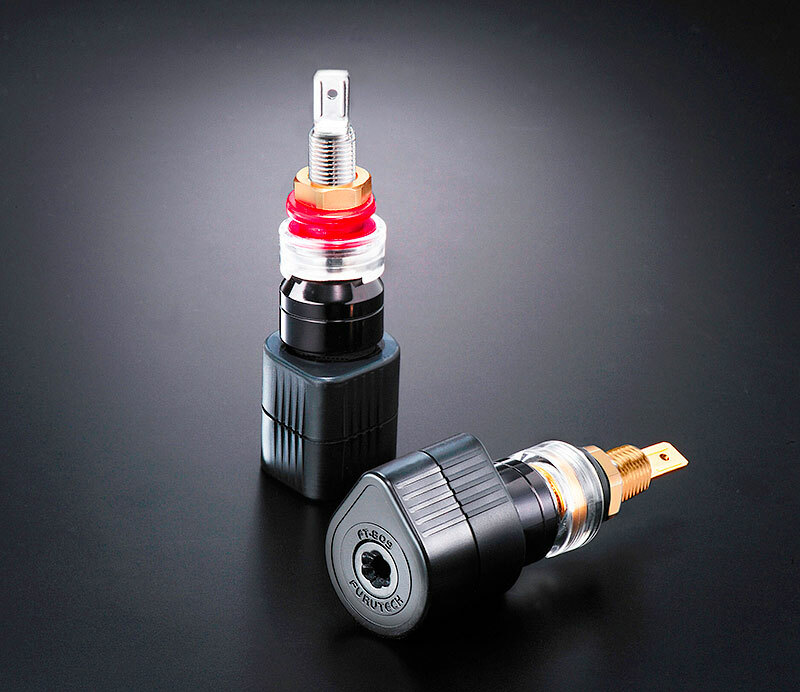 The Eichmann Bayonet Plug is not only amongst the best sounding banana plugs available, but it also outperforms many spade connectors. The Bayonet contact pin will accept a 7 AWG wire. The crimp ring is 4mm internal diameter. For larger cables, you can open the crimp ring, which offers connection to just about any size wire. The rear opening of the housing is 7.5mm internal diameter. Soldering the wire to the connector, after crimping is recommended. I've been waiting some time for Furutech to produce a low-mass binding post made with pure copper. The Furutech FT-809 delivers on that wish, and also provides a cool feature that ensures you tighten your spade connectors optimally to the posts! The Furutech FT-809 Torque Guard Binding Posts are the result of meticulous engineering and careful audition of various materials. The FT-809 binding posts feature (Alpha) pure copper conductors for minimal impedance, and features a nonresonant polycarbonate housing with eutectic copper alloy ring. The unique patent-pending Torque Guard technology prevents over-tightening, allowing each post to be evenly set up for best channel balance and signal transfer. Total overall length: 79.0 mm approx. ETI Research (formerly Eichmann) Cable Pod Binding posts are one of the most significant advances in binding post technology that I can remember. ETI Research has eliminated most of the mass of conventional binding posts, threw away the steel nuts and hardware in the signal path, and has created arguably the most sonically transparent binding post ever made, IMHO. Will fit panel thickness range of 1mm to 11 mm. Each box contains 2 pairs of pods (4 posts). Each pod may be split for non-standard binding post widths. WBT-0703 Cu NextGen Binding Post - $44.99 (1 white post) WBT-0703 Cu NextGen Binding Post - $44.99 (1 red post) WBT-0708 Cu NextGen Binding Post - $40.99 (1 white post) WBT-0708 Cu NextGen Binding Post - $40.99 (1 red post) WBT-0703 Ag NextGen Binding Post - $96.99 (1 white post) WBT-0703 Ag NextGen Binding Post - $96.99 (1 red post) WBT-0708 Ag NextGen Binding Post - $93.99 (1 white post) WBT-0708 Ag NextGen Binding Post - $93.99 (1 red post) WBT-0710 Cu NextGen Binding Post - $77.99 (1 white post) WBT-0710 Cu NextGen Binding Post - $77.99 (1 red post) WBT-0710 Ag NextGen Binding Post - $122.99 (1 white post) WBT-0710 Ag NextGen Binding Post - $122.99 (1 red post) WBT-0730.11 Signature Post Kit - $347.99 (4 posts) WBT-QD25 Gold plated brass quick disconnect - $0.75 ea. WBT-0703 and WBT-0708 NextGen binding posts are brand-spanking new, and arguably the best quality-to-price ratio of any binding post on the market. Its low mass design, pure gold-plated copper OR pure silver conductor material, and clever vibration-dampening locking nut means there's no reason to settle for those cheesy, high-mass, nickel-plated blocks of caca used by many speaker and amp manufacturers to keep costs down. Here's an afforable alternative! The core of the new WBT-0703 and WBT-0708 binding posts is similar in construction to WBT's top-of-the-line WBT-0710 NextGen series, described in the next section below. The outer materials have been economized to reduce the "bling" factor a bit- but without degrading the sonic performace. The primary differece between the WBT-0703 and WBT-0708 is the size of the locking knob: the WBT-0703 is larger than the WBT-0708. Supply is limited, so scoop them up while you can... Sold as EACH piece. WBT-0710 NextGen Signature Series are the new "king of the hill" of binding posts. WBT Nextgen stands for a new generation of connectors in which the strict separation of signal transmission and mechanical stability has permitted the use of the most ideal materials. Pure copper and/or fine silver are the best known electrical conductors for signal transmission. However, due to their mechanical limitations their use has only now been made possible through their ingenious combination with high performance plastics. The core of the new WBT-0710 binding post is not only made from pure copper or fine silver but it is also designed from one piece so that all unnecessary transition resistance is omitted. The signal conductor is embedded in a matrix of glass fibre and mineral strengthened plastic and strain relief is achieved by means of a non-magnetic stainless steel strut. The clever angular alignment of the signal conductor allows the secure fitting of spades, banana plugs and crimped cable ends. A damping ring made from elastomer prevents vibration at the contact level. On this basis, the construction is electrically insulated from the start. Design elements out of brass give the WBT-0710 binding post the expected appearance and feel of WBT products, without impairing the electrical safety. In this way, the WBT-0710 nextgen conforms to all current norms and safety regulations. With a 30 amp continuous and a 500 amp power impulse current capability all concerns are satisfied. The WBT-0710 Nextgen provides the theoretically maximum possible conductivity with the mechanical quality to be expected from WBT. Supply is limited, so scoop them up while you can... Sold as each piece. WBT-0730.11 Signature Series binding post kit includes 2 double-pole terminals (4 posts) that will handle 200A continuous current. The patented clamping mechanism ensures a high compression connection of spade connectors and crimped wire with ends up to 10awg. Accepts 4mm banana. Color code: red & white. Kit also includes 2 spacer blocks and 1 torx key. termination is solderless!